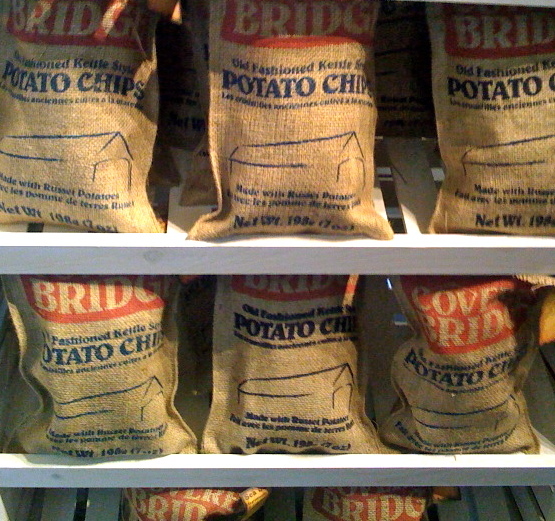 i was in one of the few stores in toronto that carry "covered bridge" chips when i first saw their trademark burlap bag. "hmph. gimmicky…" i thought and passed them up. but a mere month later, i found myself driving past covered bridge's only kettle factory and store in hartland, new brunswick. that made me take them seriously. 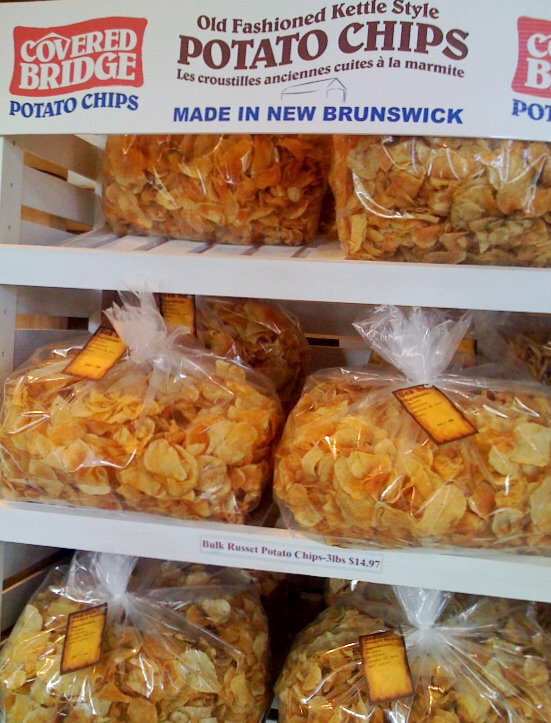 a kettle chip from a little independent start-up in potato country?! well why didn't they say so? i guess in a way, they had. hartland, NB is home to the longest covered bridge in the world, one that i've gone across, but i didn't make the connection with the name. i was excited at the prospect of fresh chips made from freshly picked NB potatoes so even though we were driving to the airport and cutting it a little close, there was no way we weren't going in. upon entering i was rewarded with a wall of warm, naked, chips, sans gimmicks.if i wouldn't have had to claim it as an extra carry on bag on the plane, i would have bought one of these 3 pound bags of chips immediately. they were bagged just feet away in the factory right behind the storefront. when the kettle is working, you can buy a small bag of chips HOT from the kettle! i brought a couple of the more reasonably sized bags back with me and they were fantastic. delicate the way fresh chips are, but still subsstantial and crunchy like a good kettle chip should be. and the flavours, while typical, were crisp too–and uncluttered. 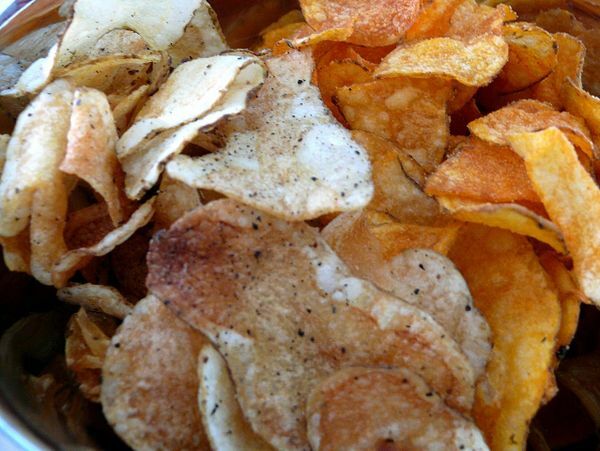 the only ingredients in the salt and pepper chips are (guess…) salt, pepper, potatoes and oil. and do i love that they are that pure. BUT…when you visit the store, you can dress up those pure chips with any of about THIRTY (probably not so natural) seasonings. i tried about five while i was there including poutine, mac & cheese and a chocolate one and they all taste exactly as promised! it was kinda freaky–much much better than the sprinkles at your local movie theatre or popcorn vendor. i don't know that i need to dress those chips up at all, but being able to buy freshly made chips and season them in any of hundreds of combinations has its appeal too. pizza and cola potato chips, anyone? what?? you'd try it!! hi! which store did you go to for the potato chips in burlap?!? i would love to serve them at a birthday picnic i’m organizing! i’ve seen them at homesense and winners in the burlap bag! Can these be purchased online?? I would just like to say your Cover Bridge in Sea Salt are so delicious and so highly addictive! My husband never eats potato chips so I was laughing when I brought myself a large bag home, went to go get some and the bag was nearly empty! So on his behalf they are very addictive to him also! I would say Russet Potatoes make one heck of a chip!